The Seattle Police department says they’re ’embarassed’ after leaving an assault rifle on the trunk of a cruiser. This has become big enough news that MSNBC is covering it. This surprised me because, it’s not as if this is the first time something like this has happened. Years ago I worked at a place called the Law Enforcement Support Agency or L.E.S.A. I transcribed police reports. (I can’t really imagine a better job for a writer.) L.E.S.A. is located on the second floor of the County-City Building. At lunch, I’d sometimes go next door to the downtown Tacoma McDonalds. Any local will tell you that the people who frequent that McDonalds are among the strangest in the entire city. 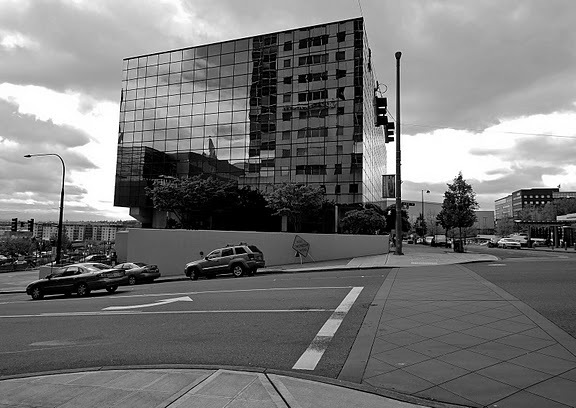 One particular afternoon, I walked out of the County-City Building and out on to Tacoma Ave. As I got to the sidewalk, I could tell that something was wrong. I looked around to see the car wreck or the fire or whatever the problem was. After a few moments I realized that most of the people on the street were looking in the same direction. It was then that I saw it; on top of one of the patrol cars, there was a pistol. And there were no police officers that I could see. Given the variable quality of the people who mill around the County City Building, I made a judgment call and walked towards the cruiser. I approached the car, picked up the pistol and tucked it in my waistband. Now everyone was looking at me. Ultimately out of all the people on a city street, I’d rather I be the armed one. I walked back to the County-City Building. When I entered, I told the security guard, who I was friends with, that I had a pistol in my waistband. He said, “Someone’s in a lot of trouble.” He then instructed me to go to the State Patrol desk and turn in the weapon. I did as I was instructed. What’s funny about this is that at no time did I think I should contact the media. We’ve all forgotten things when leaving a car. It just so happens that in this case and in the case in Seattle, they were weapons. It’s unfortunate that it happened. But it’s not a scandal. It’s not some horrible thing. It had the potential for very tragic results. It was just a simple human error and really, while it’s a problem, I wouldn’t call it a big deal. I haven’t seen Tony Daniels since 1992. Back then he was the coolest guy I knew. Seriously, it was high school and he was the one guy who was laid back about absolutely everything. Everyone else had typical high school drama. Tony behaved as if none of it mattered, because it turns out, none of it did. 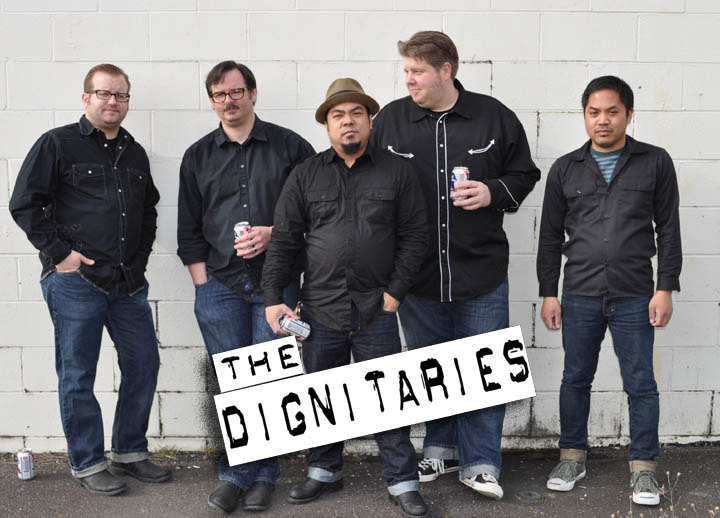 Now he’s in a band called The Dignitaries. They’re playing something called ‘Rock Music’. Just when I thought it had become extinct. Tonight, the Dignitaries will be at the New Frontier for their CD Release Party for their first album, Rocket Science. Tony was nice enough to take some time and be part of 5 Question Friday. 1. How did the Dignitaries get started? The 5 of us have been friends for a very long time. Life took its course and we never got the opportunity to hang out or keep in touch. The Dignitaries were born out of a twice a month jam night between friends just to hang out and keep in touch. Someone would bring a case of beer, another a few pizzas, and we would rock out in between hanging out. Before we knew it, The Dignitaries were born. 2. There are a ton of bands coming out of Tacoma these days, what do you think makes the music scene here so diverse? Tacoma has always had great bands coming out The Sonics, Girl Trouble, Seaweed… I am not certain what makes the scene as diverse as it is, for me it’s just cool to be a part of it, to participate in it. I suppose, and this is just a guess that the weather may have something to do with it too. What better way to spend a rainy day than to play an instrument or write a song. 3. What place in Tacoma would you like to play but haven’t yet? I’ve always wanted to play either. The Rialto or The Pantages Theaters. I remember seeing a lot of my favorite Seattle bands play The Paramount in Seattle. To me The Pantages was always Tacoma’s Paramount. Plus if we ever got the opportunity to play The Rialto or The Pantages, it means that our music has gone beyond the bar scene and reached more people. And that would be way cool. 4. How would you describe the Dignitaries to someone who hadn’t heard them? I just tell people it’s old school garage rock with the energy of a punk band. 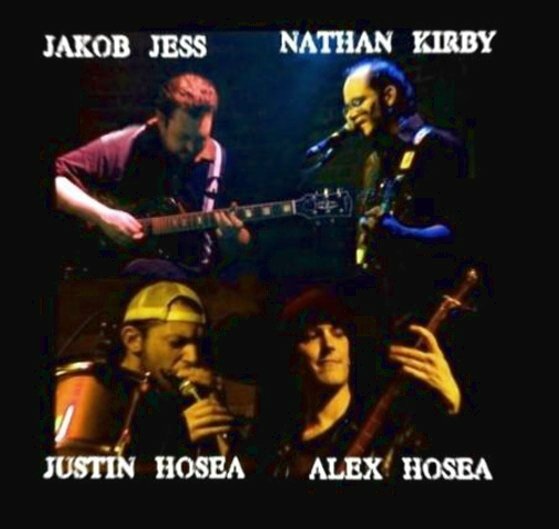 Its hard to explain because at our root we are very much a garage band, but we all have different influences we bring to the table which gives it something fresh. It gives it an energy… there’s just something special about it. 5. What’s next for the Dignitaries? Well Rocket Science comes out tomorrow at the CD release show. We’ve been sending it out to radio and print publications. The summer is pretty much booked with shows already. There are no definite plans right now, but I think we’re just going to ride the wave Rocket Science makes for us and hope that it opens a few more doors along the way. Thanks to Tony for participating in 5 Question Friday. You can see the Dignitaries tonight in Tacoma at the New Frontier, 301 E 25th St, Tacoma, WA, 253-572-4020 . In January of 1969 my father had joined the Air Force. My grandfather sent him a letter that my dad still has to this day. I’ve transcribed it below. Happy Father’s Day. As you know, I’m probably one of the world’s worst correspondents, and I think the reason is that I have such a miserable time getting into the thing. There’s something about a blank sheet of paper that apparently causes a mental blank. However, I’ve determined to write a letter for you that may communicate some of the things that I, as a father, should try to communicate to you, my son; and believe me, this comes from the heart. I think the best way may be to simply write down for you some of the thoughts that, over the years, I have found helpful when I need them. You know, none of us lives long enough to develop all his own thoughts and philosophy. About all any of us can do is to listen and read and observe, balancing one bit with another and with our own experience. This is a continuing thing throughout a man’s lifetime. All of us are faced with tough propositions at one time or another. There is never a ready-made answer. But, if you’ve been aware and listening and thinking, often you may apply the accumulated experiences of the people you have known, or read about, or observed, and thus at least have a solid basis for developing your solution. I’m not suggesting that you adopt my philosophy (actually I haven’t the art to put an integrated philosophy together.) or, for that matter, anyone else’s philosophy. I’m only offering these thoughts for your serious consideration, to use or discard. I will try to tell you why I feel the way I do about some of these simple statements. You Learn Best Through Embarrassment. I first heard this from a man I truly respected, but it took a long time (and many embarrassments) before I could accept it. I believe you will find, as I have, that the lessons learned from the embarrassing mistakes will be the ones that stay with you. To me this means that, when everything appears to be going wrong, my world is falling apart, and the chaos prevails, there are after all some things that are stable; that if I keep my head there is hope. You Can Never Take Out More Than You Put In. I think this (in, no doubt more elegant words) is a law of physics. However, I have also found it to be a law of life, and any time I have persisted in extracting from a situation more than I have contributed I have inevitably been forced to pay elsewhere. A crudely worded thought I learned from a rough and crude man. I think the idea is that, when necessary, I can wholeheartedly perform a distasteful task and still retain my personal integrity. Never Poke Bears With Sticks. This does not mean that one should timidly bypass sticky situations. It does mean that I estimate, as best I can, the likely results of an action, then arm myself with sufficient weapons, or perhaps wait until a more appropriate time when I may have a better chance of success. Well, if I haven’t bored you too stiff to wiggle, let me know how you make out with these, and I may have some more for you. You may take that as threat or promise. A couple of months ago I discovered the photography of Stephen Cysewski. I wrote briefly about it on this site and promised myself I’d get a 5 Question Friday out of him when I had the chance. Stephen recently visited Tacoma a few weeks ago and he’ll soon be releasing a new collection of his latest wandering in Tacoma. (The pic to the above is one of the new ones.) As I’m sure you’ve guessed, this week’s 5 Question Friday is with Stephen Cysewski. When I was born! Really, I have always been interested in photography. I remember trying to trade a chemistry set for a camera at a second hand store. 2. What about Tacoma makes it a good city to photograph? My memories of Tacoma from when I grew up is one reason, the other reason is that you can still see history in Tacoma, it has not been gentrified. I just visited Vancouver BC and all the “cool” stuff is gone, only memories. In Tacoma the personality is still here. Portland is similar, but in Tacoma it is not self conscious, it is real. The morning light is also beautiful and brings out the form and detail of the buildings. 3. Many photographers are very possessive of their work. Why are you so generous? I want people to see my photographs, I also want to create a place for memories. The more I share the more people will see. The more people will see the more they might look at my other photographs. I want to be known as a photographer and the only way for that to happen is for people to see my photographs. Why take photographs if you try to restrict people from seeing them. I am not a commercial photographer my goal is that in twenty or thirty years my photographs will create or resurrect memories. Think of the shareware model of software as an analogy. 4. How has digital photography changed your approach to taking photos? Not much, the concepts are the same, the images are the same. What has changed is that there are fewer gatekeepers from sharing your photography. In the old days there were books and galleries, now you can show your photography alll over the world without gatekeepers, it is really amazing. 5. What’s something you haven’t photographed that you’d like to? Well I just finished a trip that accomplished some of that goal, going to Wenatchee and Eastern Washington. There is a place called Douglas Creek that I had not seen since 1965, I finally went there. I guess I would love to go to New York and to Japan, especially Tokyo. I would also like to go to Kolkata again, it was like Bladerunner, an amazing place. I would want to go to those places with a local person, not just on the surface. Laos is also a beautiful place, the images of Buddha in the old temples are truly beautiful. I noticed on my recent trip to the Northwest that I loved nature, I take it for granted, but large trees are really amazing. I have to count the days and years and to be thankful for my health. Mostly I want to photograph where I am, going places is cool, but taking photographs of places you know is very satisfying. Tacoma has many more places for me to explore and it is not spoiled like so many places. Thanks to Stephen Cysewski for participating in 5 Question Friday and for sharing your photos with everyone. Go to his website, http://wanderingintacoma.com and see Tacoma in a whole new way. Last week 20-year-old Melissa Cathryn McMillen gave birth to a baby girl in her bathroom in a house in the 5300 block of North 39th Street. She left the baby in the toilet for 90 minutes and took a shower. According to the medical examiner the baby was alive when she was born. After she had showered, she wrapped the body of the baby and put it in a book bag. Tuesday night Melissa’s boyfriend arrived home after being gone for a few days. He’d found the baby in the bag and called 911. He said that his girlfriend had given birth to a stillborn a few days ago. Melissa McMillen has been charged with 2nd Degree Murder. When I write about homicides that happen in Tacoma, I do my best to write about what happened and if possible, what sort of person the victim was. I try not to let my personal opinion influence things too much. In this case, I’m finding it difficult. At this point it’s unknown what exactly was wrong with Melissa McMillen. She is either mentally ill, very stupid, or absolutely evil. Possibly all of the above. I don’t know. I don’t care. It’s this sort of senseless crime that made me take a break from writing up Tacoma homicides. Still, I feel it’s important to give a voice to those who’ve been killed in Tacoma and I’ll continue to do so. Baby Girl McMillen died without even having a name. But she will not be forgotten. Photography courtesy of S & C Photography, Salem, OR. This week’s 5 Question Friday is with Jayme Lowenstein Lillie. I first met Jayme in high school. We worked together briefly at the Tacoma Youth Initiative. Though she hasn’t moved out of the area, she is one of the many friends from high school who I haven’t seen in many years. It turns out that during that time, she’s started Lillipops Designs, an awesome clothing line for children that has even more awesome photos. Here’s Jayme. 1. What is Lillipops Designs? Lillipops was born from the desire to dress my children in eco-friendly, fashionable clothes that didn’t A. look like they came from the recycle bin and B. didn’t require robbing a bank to buy them. I’ve always been one of those people who loves to troll the thrift stores, and this germ of an idea started brewing. Once I saw past hideous cuts and focused on the raw materials, a whole world of design possibilities opened up for me. I’ve since branched out into organic and authentic vintage textiles, but there is still a love and respect for turning something awful into something beautiful. 2. What has been the biggest challenge in operating your business? My biggest challenge is honestly a challenge I’ve completely created for myself. I don’t delegate well… I’m a textbook perfectionist. I’m finally starting to understand that I can’t and shouldn’t do it all. There are people out there who are better at public relations, better at marketing, better at accounting, etc., and finding (and hiring) those people frees my time to concentrate on what is really important to me. The last hurdle has been to find qualified assistants that can actually do some of the garment production. I’m getting there. 3. Do you think Tacoma is a good place to start a small business and why or why not? Honestly, I think Tacoma is as good a place as any to start a business. I know there are resources available to start-ups, but I haven’t really reached out in that way. One thing that Tacoma has going for it is a strong sense of community. Even if you aren’t using official community business resources, there is a wealth of highly creative people here that really do want to see others succeed. Going into this venture, I thought there would be more of a competitive spirit between designers/photographers/business owners, but I’ve really found that if YOU are willing to contribute to the community in a positive way, doors open right up. 4. You’ve got some amazing shots of children in your clothes. How do you manage to get those shots? I’m a big believer in trade value. I’ve never paid a photographer to get a shot. But I have a waiting list for photographers around the globe that want a chance to photograph my pieces. It’s a two-way street… the photographers get style samples to keep, and I get images that have completely changed the way my business is perceived on a national level. I have incredible relationships with professional photographers here in the US, South Korea, Abu Dhabi, Australia and Canada, and I make sure my customers know all about their talents. In return, the photographers I work with promote my business and offer incentives to their clients for purchasing my pieces for styled shoots. At this point, I’d say a third of my customers are professional photographers that want to recreate the look for their clients that they see in my marketing. 5. What’s next for Lillipops Designs? Good question… and one that makes my head spin if I think too much about it. I’m collaborating with three other national children’s wear designers on a project of epic proportions that will undoubtedly bring some major changes to my marketing and workflow. We’re keeping the details under wraps for now, but it’s going to be huge, and really fills a gap in the children’s wear market. I’ve also stepped into the women’s wear arena, and have a new branch of Lillipops called Poppy and Lilli. This line is focused on really comfortable, timeless pieces that work on every body. My cardigan wrap is my signature piece, but I’ll be expanding into vintage lingerie inspired loungewear soon. Think Doris Day does yoga at the park. Above all, I’ll be managing “The Lillipad” (aka the household), raising three incredible kiddos, nurturing a marriage, and trying to find time to sleep every once in awhile. OK… THAT’S the best part of working in Tacoma. A coffee place on just about every corner. Thanks to Jayme for participating in 5 Question Friday. For more information on Lillipops Designs, click on the links below.